In a state as geographically diverse as Colorado, even the typical Centennial State experience resists the idea of pigeonholing; you’ll find everything from high desert to sand dunes to towering fourteeners within our borders, all begging for enthusiastic exploration. But if any kind of thinking is quintessentially Coloradan, it’s thinking outside the box — so we’ve rounded up seven fun, funky and totally unexpected ways to explore our great outdoors and Come to Life. Where there are mountains and rivers, there will be canyons — leave it to Coloradans to find a completely immersive way to explore them. 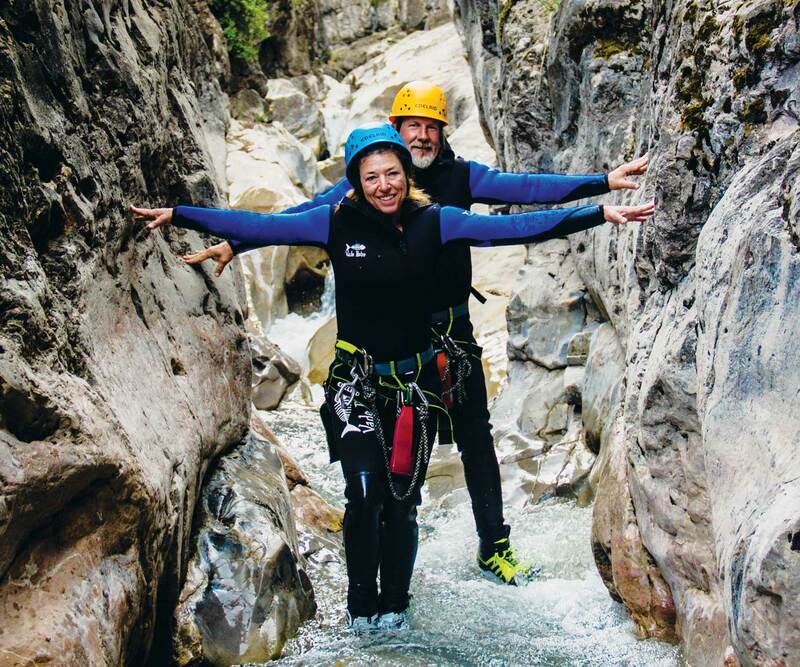 The southwestern Colorado town of Ouray, rightly nicknamed the “Switzerland of America,” is a perfect place to try your hand at canyoning: an all-levels sport that involves descending (safely) into the void and mastering a variety of terrain before climbing back out. Under the tutelage of the expe­rienced guides at Canyoning Colorado, you’ll learn how to downclimb, scramble and rappel before you tackle the ultimate challenge: a controlled descent down a 50-foot water­fall, directly under the flow. All equipment, including wetsuits, is provided; no experience is necessary, but a reasonable level of fitness is required. Where to Stay: You’ll be in good company at Ouray’s Beaumont Hotel — everyone from Theodore Roosevelt to Oprah Winfrey has stayed in this stately 1886 property, which consistently makes best-of lists from Condé Nast Traveler. Set in the shadow of Pikes Peak, the charming mountain community of Cripple Creek first attracted the nation’s attention during the Gold Rush, when the Cripple Creek & Victor Gold Mine yielded a rich vein of the precious metal. Though the mine is still in operation more than 100 years later, today the descendants of its original work team are the main attraction. Now in its 88th year, Cripple Creek Donkey Derby Days in June is a whimsical way to experience a bit of ’niner heritage. Visitors from all over the world come to watch the town’s donkey herd — whose lineage does date back to the Gold Rush — compete in a variety of races and events. A pancake breakfast, along with hairy-leg and best-beard contests, adds to the frontiersmen flavor of the festival. Where to Stay: Hole up at Carr Manor, which began its service to the community in 1905 as Cripple Creek High School and was converted to a luxury boutique hotel in 1983. Charming historic touches like the original classroom chalkboards remain throughout the property. Less than a two-hour drive from Denver, the breathtaking Vail Valley isn’t exactly off the beaten path by Colorado standards. Unless you’re embarking upon a Heli Fly Fishing Adventure with Minturn Anglers — in which case you’re technically above the beaten path. Adventure-savvy anglers, take note: This one-of-a-kind trip gives you the opportunity to get a jaw-dropping aerial view of Vail Valley’s panoramic vistas before touching down on one of the company’s remote private ranches for a day of fly-fishing in glorious solitude. Minturn has exclusive access to Gold Medal waters like Gore Creek, which is positively teeming with brown and rainbow trout. Where to Stay: Think you’re above glamping? You might want to check out the rustic elegance on offer at 4 Eagle Ranch be­fore you book a basic campsite or hotel room. Picture an old-school canvas safari tent in a sprawling mountain valley, with views of the Sawatch Range beyond. Now add a king-size bed and luxury furnishings that rival a five-star hotel. In short: total perfection. 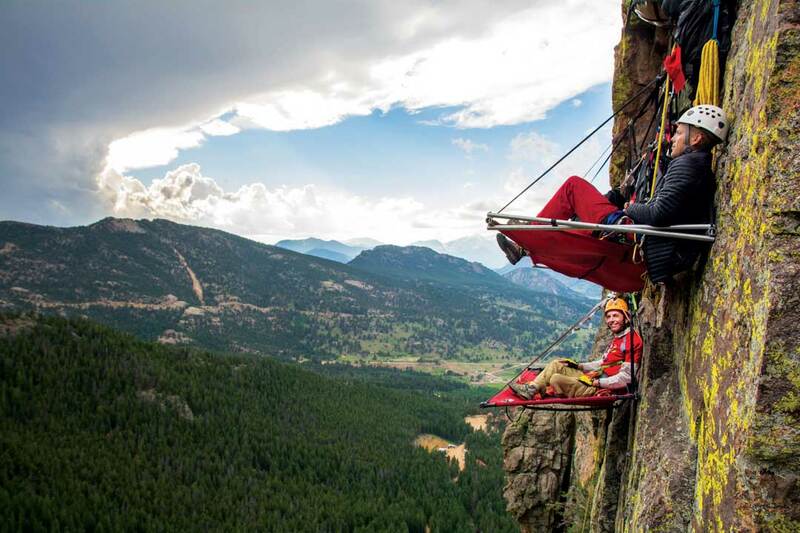 Estes Park and its main at­traction, Rocky Mountain Na­tional Park, are already bucket-list items for most Colorado visitors. But for the good folks at Kent Mountain Adventure Center, it’s no fun unless you hoist that bucket 50 feet off the ground … then hang it from a sheer rock face. That’s exactly what the outfitter’s cliff-camping excursions are about. After walking you through a few rock-climbing basics (rappelling, fixed-rope ascension and more), you and your guide will set up a “portaledge”: a semi-rigid hammock that hangs from cables bolted directly into the mountain­side. From your perch high above the valley floor, you’ll enjoy a sunset picnic dinner before crawling into your sleeping bag for an unforget­table evening on the brink. Where to Stay: Bookend your cliff-side adventure with a stay at Basecamp Boulder, an ultra-cool modern hotel with a summer-camp vibe. Trust us: Ask for the Great Indoors Room. As any good sailor knows, there’s a unique perspective that comes from a day on the water — and when that water is surrounded by soaring mountain peaks, one’s worldview reaches an entirely new level. Thanks to Windrider of the Rockies, operating out of Frisco Bay Marina on sparkling Lake Dillon near the towns of Dillon and Frisco, you can tap into all of it … even without a whit of sailing experience. Experienced sheet-pullers need only take a quick verbal quiz before shoving off; newbies can learn to tack and trim under the guidance of Windrider’s experienced team. Rather not do the work yourself? The company also offers guided sailboat tours of the 3,300-acre lake. Where to Stay: Stay at the close-by Frisco Inn on Galena, a European-style bed and breakfast with a modern mountain feel. Not only will you be just steps from the classic mountain-town experience, Frisco’s gateway location gives you easy access to all the Rockies have to offer. Blessed with mile after mile of picturesque pavement, Colorado has long been a haven for cyclists. Now, thanks to the recent introduction of electric bikes (or e-bikes) in select cities, this two-wheeled mode of transportation is sud­denly more modish than ever. Colorado Electric Bikes in Grand Junction and Rapid Creek Cycles in Palisade offer e-bike sales as well as rentals and repairs. Hire a charged-up cycle to tool around town or explore the wonderful local road-bike trails; e-bikes go up to 20 miles per hour and travel an average of 30 miles on a full battery. We recommend the Tour de Vineyards ride: 25 miles of paved road through the area’s gorgeous wine country. Where to Stay: Nearby Palisade’s sig­nature striped bluffs provide a spectacular backdrop for your stay at the Wine Country Inn — a sprawling Napa-style hotel set amid the vineyards. A daily complimentary wine reception and onsite farm-to-table cuisine complete the picture. One of the most significant trail systems in the world, the Conti­nental Divide Trail (CDT) spans 3,100 miles and connects three countries (Canada, America and Mexico), five U.S. states and countless communities along its snaking spine. The lon­gest roadless section of the CDT is here in Colorado, surrounded by the remote glacial valleys of the Weminuche Wilderness. The hidden gem of South Fork, recently named “Colorado’s Top Small Adventure Town” by Elevation Outdoors magazine, is the perfect home base for hiking this stretch of the trail; it’s an official CDT Gateway Community, so many local hikes join up with the CDT system. Both the Archuleta (7 miles) and Crater Lake (2 miles) trails offer arresting wraparound views. Where to Stay: If stunning vistas are the theme, carry the thread through by staying at the Arbor House Inn B&B in South Fork — where the South Fork of the Rio Grande River tumbles musically by your windows 24/7, with the cliffs of the San Juan mountain range rising in the distance. Read about Colorado adventure tours and check out our Colorado Outdoor Adventure Blog for more inspiration. Photo Credits: Cliff camping in Estes Park, courtesy of Kent Mountain Adventure Center; Canyoning in Ouray, courtesy of Canyoning Colorado.